Many years ago when I first sat down to write a book I used a typewriter and the kitchen table. Not long after that my husband brought home a portable computer that used a big floppy disc, and we set it up in the spare bedroom on a desk we had gotten from a friend. My office was born. Sort of. Through the years I got new computers, printers and software that all required a learning curve. We moved numerous times, and each time I had that original desk. Although I shared my office with my husband, at that time, he had a job where he went to work outside the home. So I had the office to myself most of the time. When we moved to Florida in 2001, he started his own company and worked from home. My office became our office. It was upstairs in what is sometimes called a bonus room. My desk would not go up the stairs, so it wound up as a catch-all in the garage. 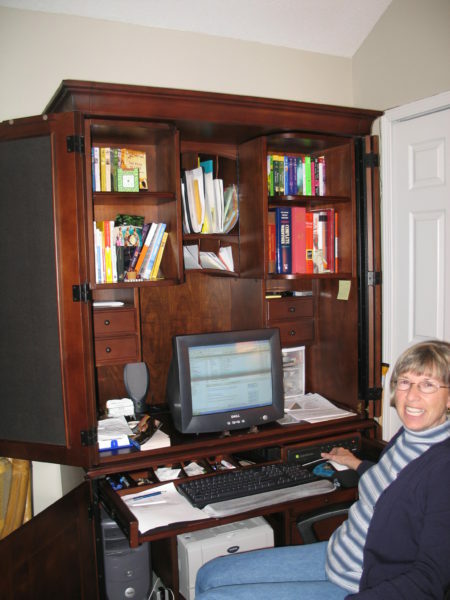 I bought a small secretary desk, but I soon learned that it was too small for my needs, but I typed out the manuscript that eventually became my first book for Love Inspired, The Heart’s Homecoming, while sitting at that desk. Eventually, my husband realized that I needed a bigger desk when he was confronted with my piles of stuff all over the floor around my desk. Here is a photo of me sitting at my new desk while we still lived in Florida. I was thrilled. In late 2012, we thought we were going to split time between Florida and Arizona, so I bought a desk for our Arizona place that I put together myself and placed in my corner of the office. When we moved to Arizona permanently, of course, my big desk came along. We gave my temporary desk to the daughter of some friends. Our office space in Arizona is much smaller than the space we had in Florida, so we had to figure out how everything would fit into the space. We made templates the size of the different pieces of furniture out of cardboard and placed them on the floor to see which arrangement would work best. My desk wound up in the corner to the left of where the temporary desk was. Here are some photos of my space now. I have doors that will close on the upper part of the desk, but they are rarely closed. Inside the doors are bulletin boards. 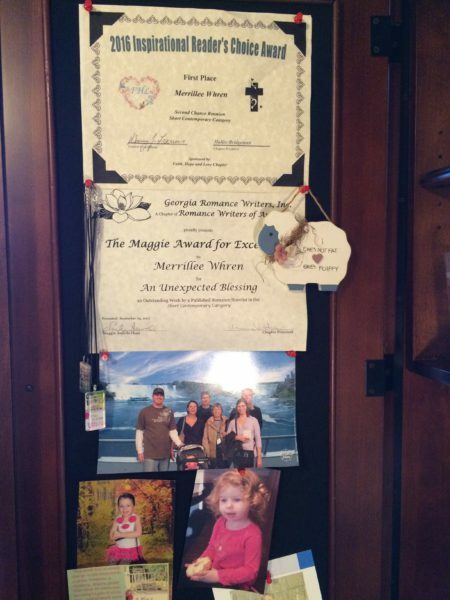 They are perfect for award certificates and photos of my family, especially my granddaughters. There are lots of shelves for books in my desk. I have many resource books about writing that you can see in the first photo below. The other side is where I keep my dictionary, thesaurus and style manuals. Once upon a time I was a school teacher, so I have a couple of glass apple paperweights, although they aren’t holding down any papers. The best part are the hidden shelves behind these shelves where I have too many books that still need to be read. My desk sits next to a window that looks out on the street. I’m not that tempted to look out because the best views are the ones that look out from the back of the house. This view might have me gazing instead of writing. Finally, here is a photo of my desk in one of it’s neater moments. Tell me about your special place where you work on projects or a hobby. 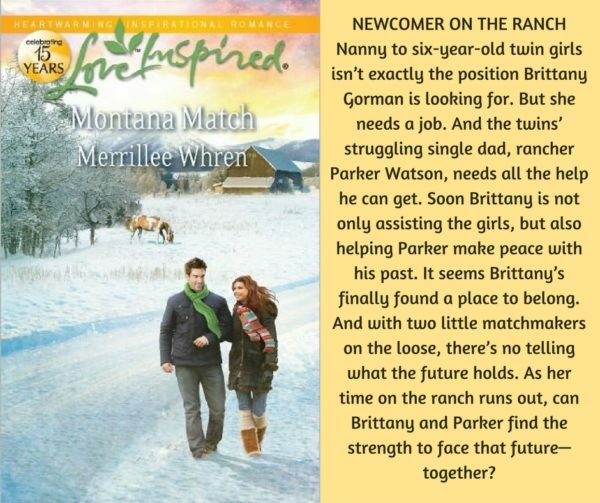 I have of copies of an older book, Montana Match, that I will give away to anyone who goes to my website and sends me a message with your mailing address, so I can mail you the book. While you’re there if you haven’t already signed up for my newsletter, please do so. 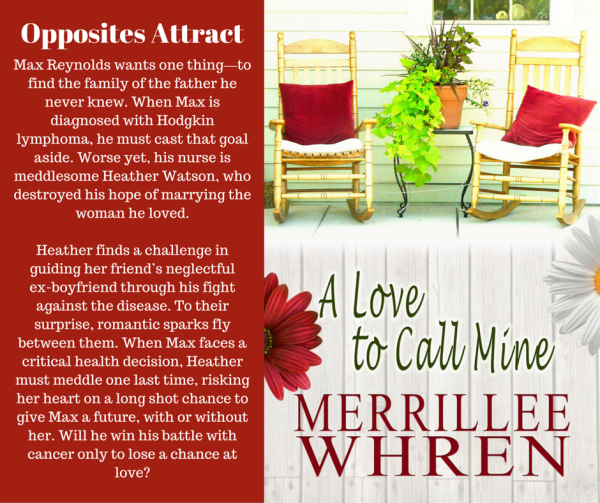 You can preorder my latest book, A Love to Call Mine. 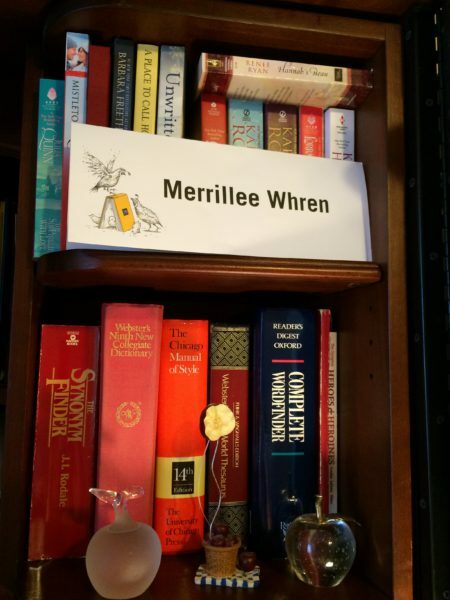 I loved this, Merrillee! I always enjoy seeing where writer’s write. You look so happy in your space. :) One of my favorite spots to write is on our back patio. Although the hummingbirds are quite a distraction. Love your view! Thanks, Jill. If I worked on my back patio, I wouldn’t get much work done. Too many distractions. I remember Typewriters too. I spent 2 years in HS learning to use them; 1yr for a Manual, & the 2nd year for Electric. Esther, I actually hated typing class, but I’m glad I learned to type. As a reader and retired English teacher, I am always interested in what makes a writer tick. Informative blog about your space and the tools of the trade. Thanks for the pictures. I can relate, since I had high school typing and in college used a typewriter. In the mid 1980s my husband purchased our first computer. 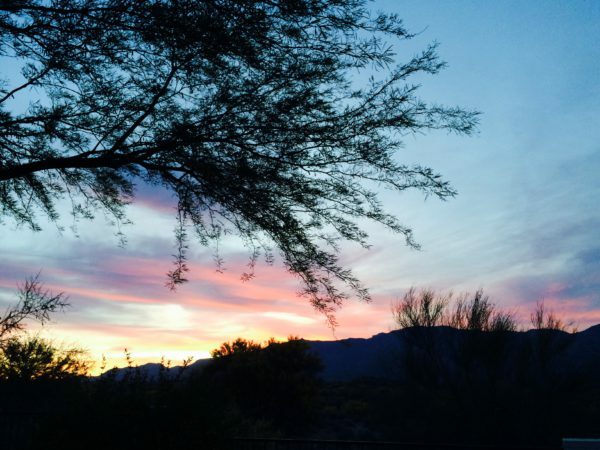 While our three sons were living home, I had no office. The computer was in the family room and my books for teaching where in the basement. 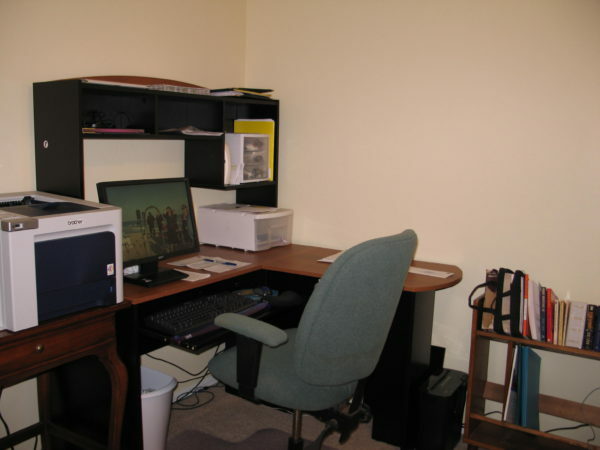 After our oldest two sons moved out, I had an office with my own computer, even though most of my books are still in the finished basement family room. I also have a craft area in the basement. Renate, we also got our first computer in the mid-1980s. I don’t think I would have finished a book if we hadn’t gotten a computer. My typing skills were not good even though I took classes. With a computer, I don’t have to worry about making a mistake. I can quickly correct it. No correction tape or correcting fluid. It’s nice to have space to work on crafts. I really like your working spaces. I often work from home and I get a big desk to spread my things around. In our old apartment I had a similar set up as your Florida desk (minus the printer and add an extra monitor). We’ve been talking about getting another monitor now and I was also considering some shelves but we ended up hanging a bunch os posters and boards on the wall so we are sticking with those instead. I love working in my litte home office. Priscilla, I’m glad you have a space you like. It helps when your working space suits you. Elizabeth, working on a laptop does provide mobility. My latest computer is a laptop, and it is behind my monitor on the desk. When I had my tennis injury and couldn’t climb the stairs, I took the laptop downstairs and worked there for a couple of months. Even after I was doing better, I left the laptop downstairs because I knew we were going on vacation, and I didn’t want to have to hook up the computer and unhook for our trip. I enjoyed having the laptop downstairs for a while, but I like the privacy of the office, especially in the evenings when my hubby is watching TV. Rita, I hope you enjoy it. It’s one of those books whose characters I lived with for a long time before I wrote their story. Ginger, as writers, I think we find whatever place we can to do our writing. I’ve been fortunate that we’ve had one room in our house where would could have an office. I know you’ll enjoy having one. I understand about the kids. They grow up too fast. I had an office but I just didn’t enjoy working there. I now have a computer mounted on a swing arm by my living room recliner, and that’s where I do 99.9% of my writing and surfing! 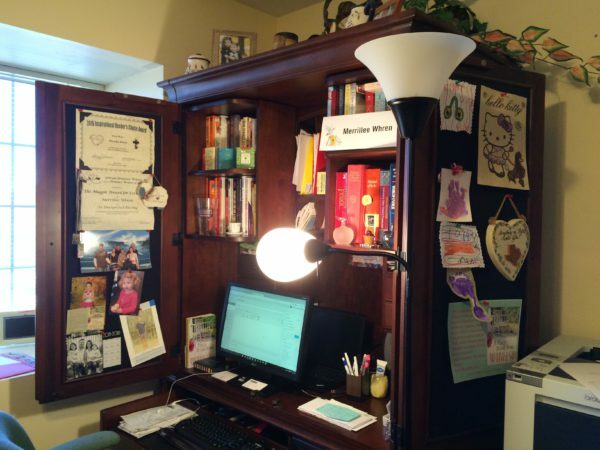 There’s a window and a bookcase, so it works for me, although I sometimes miss my huge bulletin board upstairs…. but not enough to move back. Valerie, I can’t imagine not having an office space, especially since hubby watches TV downstairs, and it is distracting. You must have a quiet living room. Love your office space Marilee. I would love to have one of your boojs to read. I lay in my hammock by our pond a lot when I’m reading and doing reviews. It is very relaxing. Didn’t know if I was suppose to put my mailing address on here. Deana, go to my website. There is a link in the blog post. There is a contact button there you can use to send me your mailing address. I have an old governors desk that I use for a desk . I had a really old typewriter one upon a time, too. Now I’m amazed at what we can do with computers, tablets, and cell phones☺! Diana, me too. Technology has opened a whole world. Mimi, thanks for visiting the blog. Beth, you’re welcome. I guess laptops have enabled us to work from anywhere. 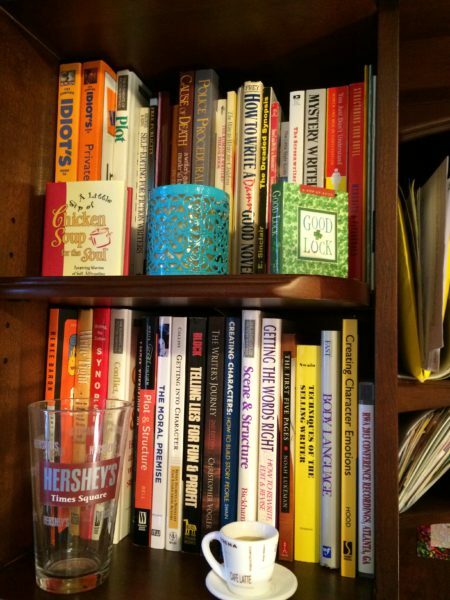 I have a copy of “Montana Match” still yet to be read….so many books, so little time!